Single Story! Four Bedrooms! Quiet Neighborhood! Centerra Mirage Elementary and Desert Edge High School. Move In Ready! Abundant Energy Efficiency Options! 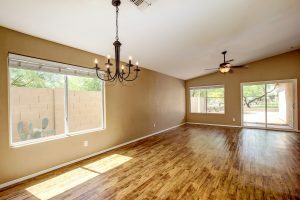 FOUR Bedroom in Great Goodyear Location! Corner Lot backs to Green Belt space. Only One Neighbor! Quiet, Well-Maintained Neighborhood. New Carpet. Split Floorplan. Single Level. Soaring ceilings and warm wall tones throughout. Kitchen is complete with updated breakfast bar, a plethora of custom cabinets, and black appliances. Master suite has new plush carpet with ceiling fan and picture window. Large Bathroom with dual sink vanity and separate soaking tub/shower. Spacious walk in closet. 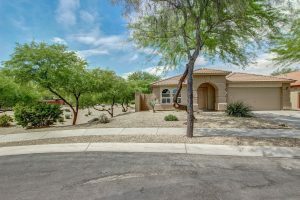 Backyard features a covered patio with desert landscaping and green belt views! This home is sure to go quick, so come see it today! Close to I-10, shopping, and ente rtainment and part of Centerra Subdivision.